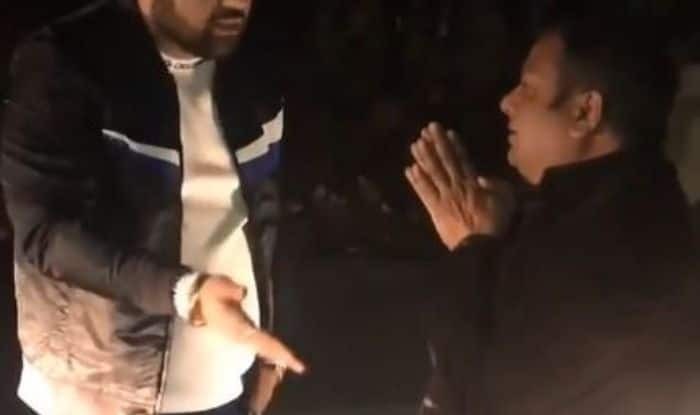 Known for bizarre video contents on YouTube, Rakhi Sawant‘s beau, Deepak Kalal is seen being beaten up by a man in a recent video which the celebrity uploaded on the site. The man beating Deepak is also using abusive language and while some consider the video to be shot in Gurgaon, others are of the opinion that it was recorded in Delhi. Needless to say, the video has become viral with a few minutes of being uploaded. The man beating Deepak Kalal is heard saying that the latter’s video contents on YouTube has adverse effects on viewers. Given the large number of Deepak’s followers on social media, especially school and college going children, the angry man holds Deepak responsible for creating a bad impression on the children’s minds. The angry man is then seen threatening Deepak to not make such videos again while he (Deepak) looks on, frightened. Assuring not to post any objectionable video again, Deepak is next seen apologizing to the crooked person. A couple of weeks back, Rakhi Sawant had announced her wedding with Deepak Kalal on social media and quite disgustingly, he had shared Rakhi’s ‘Certificate of Virginity’ which read, “Certificate of Virginity (From Front and Back) presented to Rakhi Sawant for outstanding celibacy. 28 November – present” (sic). Earlier, on being asked about her wedding plans, she revealed to Times of India, “Wedding will take place in Los Angeles on 31st of December this year. There might be some functions that will take place here in India. I am going to invite everyone from Bollywood but I don’t know who all will come there. But Shah Rukh Khan, Karan Johar, and Khali are going to attend my marriage as I have got a confirmation from them and they are going to come”.